Best Cigar Bar in the Chicago Land Area! Whether you’re reading about a favorite bourbon or a new craft gin, you just might think of an old friend. Where quality and comfort meet your life style! Where quality and comfort meets your life style! BASEBALL || FOOTBALL || ICE HOCKEY || BASKETBALL Smoke, drink, and relax while you watch your favorite teams in style. WELCOME TO KARMA CIGAR BAR! 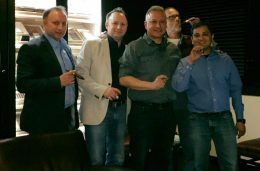 Welcome to Karma Cigar, Indiana’s Premier Cigar bar and lounge. We offer a wide variety of cigars from mild, medium, to full, from Arturo Fuente OpursX, Liga Privada, Davidoff, Viaje, Roma Craft, Ashton, Camacho, AVO, Cohiba, CAO, Rocky Patel, Romeo, Montecristo, Delicioso, EPC as well as an extensive selection of boutique cigars including My Father, Asylum, Hirochi Robaina and Oliva cigars. Complimenting our cigars is our full service bar with beer and wine listings offering a worthwhile experience for all our guests. 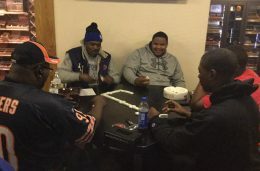 Visit our 3200 square feet lounge in Merrillville, Indiana just west of I65 and enjoy a cigar, drink with good friends. Relax and enjoy yourself at Karma as we strive to give you the very best in cigars, spirits, and atmosphere for your pleasure. Enter our 400 sq ft walk-in humidor and 64 feet of humidified wall and floor display cabinets, view over 1,200 facings of premium cigars that will satisfy your smoking palate! Our 3200 square foot space offers a great environment for smoking our premium cigars with friends and associates! We host a variety of events every month as well as offer weekly specials on cigars, beer, wine, and alcoholic drinks. Come to Karma and watch the Cubbies, White Sox, Bears, Bulls, Black Hawks, and other sports for your viewing pleasure! We have a wide variety of spirits to enjoy including red and white wines, blends, domestic and premium beers, vodka, gin, bourbon, whiskey and tequila as well as beer and premium wines to wet your palate! From Jazz to Fusion, Reggae to Folk, Hip Hop to Rock, we've got all the styles for your listening pleasure! Did you know that we have a wonderful selection of snacks to satisfy your appetite? From wraps, pita chips, pizza, we have it all! Such a fantastic place. I’m not a big cigar smoker, however, I enjoy the experience. Karma provides a setting to fully experience the atmosphere and camaraderie for the customers. The staff is always knowledgeable and super friendly. And the owner and his wife are such gracious host’s. I was only there for about two hours or less , and it was my first time in that city…but in that time, I had the best time ever. I mean the owner treated me as if I was a celebrity. 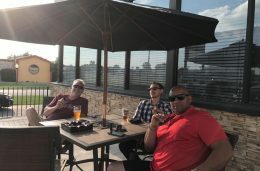 The atmosphere was amazing..the selection was top of the line and the people was all so cool…Awesome place indeed..
Amazing service, full bar, crazy huge cigar selection, Heather is amazing and knows more about cigars than the tobacco leaves themselves. The owner is a class act that comes over to greet you. 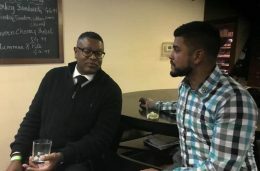 Super comfortable and overall a great place to meet with fellow cigar lovers and enjoy a great cigar in a great atmosphere. Highly, highly recommended. Chicago vibe right in our backyard in Northwest Indiana. The owner and staff provide VIP treatment and a personalized customer experience. Whether you are an aficionado or a novice the staff is there to provide guidance and recommendations on that perfect cigar(s). The drink selections are on point matching that desired spirit with that perfect cigar. Location and parking is ideal and facilities are clean. WHERE QUALITY AND COMFORT MEET YOUR LIFESTYLE! The corner you can share with us your captured moments here at Karma Cigar Bar! Having fun time at Karma Cigar Bar. We’re going all out for Dhiren's Birthday! Mark your calendars for The My Father Cigar + Tatuaje + Zacapa Rum Tasting Event. As always, enjoy massive deals on all My Father Cigars while enjoying fine Zacapa Rum. There will be good food, live music, and plenty of giveaways. Meet Michael Perales & Jose Ortega from My Father Co. and Jeevan Singh from Southern Wine & Spirit. Enjoy sensational R&B sounds by Manuel "Manny" Feliciano. $30 in advance. $35 at the door. Register today to reserve your spot! Limited spots available! Reserve yours today! WEDNESDAY SPECIALS || Featuring Stella Rosa Black paired with CAO Cherry & Riazul Anejo paired with AVO Classic. It’s been a long winter. There’s a good chance that a lack of warm weather has caused you to neglect your humidor and the cigars inside it. Occasionally, in spite of all your efforts to care for your cigars, they dry out and you need to bring them back to life. If you find yourself in this situation no need to fret. Your cigars can be brought back to life so as long as a) the wrapper hasn't cracked, and b) the cigars have not become so dry that all the oils have evaporated from the tobaccos. #2) Recharge your humidification element with distilled water or throw in a fresh humidity pack. The humidor will gradually return to the optimal 73-74% relative humidity and the cigars will follow suit. #3) Wait. It takes from one to three weeks to rehumidify a cigar, depending on ring gauge and how dry your cigar is. It is not enough to just humidify the wrapper; moisture must reach back into the innermost leaves of the filler. Again, this takes time. A cigar that hasn’t been properly rejuvenated will smoke hot with an unpleasant, bitter taste–so be patient. Karma has you covered on all your humidor needs. Next time you’re in the lounge, ask about our cigar care and humidor maintenance products. TUESDAY SPECIALS || Featuring Macallan 12 paired with EPC Encore & Balvine 14 paired with Liga Privada 9. Cigar Brand Highlight: Tatuaje || Old World for a New Generation: Tatuaje (Spanish for tattoo) is the brainchild of owner Pete Johnson in his mission to make a boutique brand of cigars to cater to the refined palates of today’s cigar enthusiasts. Pete teamed up with famed master blender Don ‘Pepin’ Garcia and the rest is history. The result is countless 90-plus rated tobacco blends, and a full-bodied reputation with enough versatility to dabble in subtle and creamy or medium-bodied handmade cigars that are both celebrated across the globe. The creation of these premium Tatuaje cigars are comprised of Nicaraguan Cuban-seed tobaccos and are either cloaked in a stunning Ecuador Habano wrapper or a thick Connecticut broadleaf. Among the masterpieces are Cabiguan that provides an excellent balance of sweet cocoa, pepper, and leather, Riqueza a dark pressed cigar offering notes of spicy cocoa and hickory, and Ambos Mundos along with many others. MONDAY SPECIALS || Featuring Woodford Reserve paired with CAO Consigliere & Angel’s Envy paired with Ashton VSG. SUNDAY SPECIALS || Featuring Makers Mark 46 paired with My Father Lebiju & Oban 14 paired with Davidoff Anniversary. Karma Cigar Bar's website contains tobacco and alcohol related content, and you must be 21 years or older to view this content.